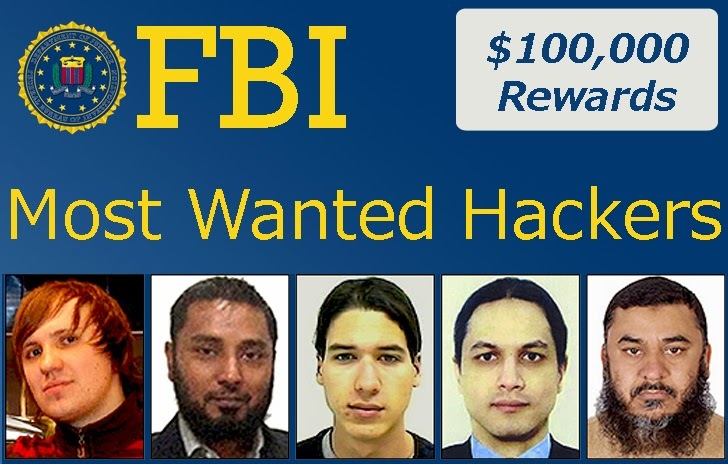 The US Federal Bureau of Investigation has added five new hackers to its Cyber most wanted list and is seeking information from the public regarding their whereabouts. The men are wanted in connection with hacking and fraud crimes both within the US as well as internationally. Rewards ranging from up to $50,000 to $100,000 are being offered for information that leads to their arrest. Two of them are Pakistani, Farnhan Arshad and Noor Aziz Uddin, who caused the damage of over $50 million after hacking business telephone systems between 2008 and 2012. Arshad and Uddin are part of an international criminal ring that the FBI believes extends into Pakistan, the Philippines, Saudi Arabia, Switzerland, Spain, Singapore, Italy, Malaysia, and other locations. Alexsey Belan, a Russian national, is wanted for alleged hacking of three US-based companies between 2012 and 2013. Carlos Perez-Melara is wanted for his alleged involvement in manufacturing software that was used to intercept the private communications of hundreds of victims around September 2003. As part of the scheme, Perez-Melara ran a website offering customers a way to “catch a cheating lover” by sending “spyware” disguised as an electronic greeting card. The rewards are being offered for each of the five fugitives, all of whom are believed to be living outside the U.S.
"The expansion of the Cyber’s Most Wanted list is a reflection of the FBI’s increased efforts in this area," FBI officials said in a statement.